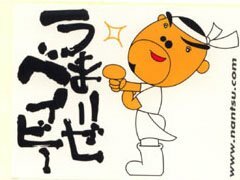 Nantsuttei is one of the hottest ramen places in Tokyo at this moment. 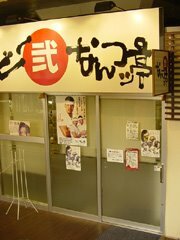 Nantsuttei's ramen has not only been hugely popular with long lines where you have to wait at least 30 minutes or more, the man behind this store has become quite a personality in the ramen scene, often appearing on TV and even selling character merchandises of himself. Nantsuttei recently won a ramen competition on Japanese TV, I unfortunately had to visit them the day after that TV show and had to wait near an hour until I got my order of らーめん+温泉玉子 (ramen + hot spring egg). 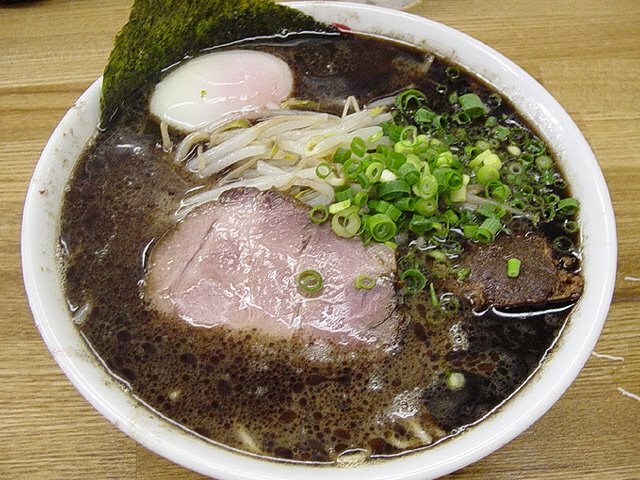 The Soup - is a lightly flavored tonkotsu (pork bone) soup that is topped with a special burnt flavored black oil that the store calls マー油 (ma-yu). When you first get the ramen you see this black soup, which forms a nice contrast once you run your spoon through the ma-yu and expose the white tonkotsu soup underneath. The tonkotsu soup itself is cooked with a variety of vegetables giving it a milder flavor, while the ma-yu is created through a seven step process of frying garlic in different methods to get the burnt flavor just right. The Noodles - are not your straightforward Tonkotsu style noodles. 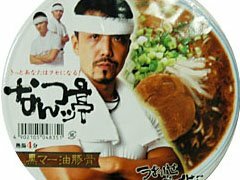 Nantsuttei's ramen noodles are slightly thicker, uses a slightly higher water content making it springier than most Hakata style ramen. Needless to say, Nantsuttei spent a lot of time getting this ramen just right and it matches the soup nicely. The Toppings - are all top notch. The cha-shu pork is slightly tender but the flavor is wonderful and matches the ramen well. The bean sprouts provides a nice contrast to the oily soup, while the green onions flavor compliments the garlic flavor of the soup. The hot spring egg is a little runny, both the egg yolk and the egg white and took some getting used to. Overall - I highly recommend Nantsuttei to everyone. Nantsuttei has a strong personality that sets itself apart from all the other ramen out there. The flavor of this ramen is simply delicious and should appeal to beginners and veterans of the Japanese ramen. Nantsuttei is not easy to get to though. The closest store in the Tokyo area is Shinagawa which is about 20 minutes from Shinjuku, if you include the waiting time that is more than likely you might be looking at spending an hour or two including the round trip travel time. Do it. Wait in line. It might be one the best Ramen you'll ever eat in your life. :) A great place to eat and enjoy.